We’ve had such a great response to our 11th anniversary healthy deodorant giveaway. Our body and breast thermography patients in Sherman Oaks are loving the selection of scents available and the available option of a good deodorant. We are continuing the gift through June 2018 for all annual and initial breast and full body thermography scans. How did I become so fanatical about deodorants? After looking at armpits on breast thermography for eleven years; I can usually spot the ones that are being suppressed with regular antiperspirant or commercial deodorants. Antiperspirants use aluminum to plug up the sweat glands. Plus, there are a lot of other toxic chemicals in the products. Regular deodorants may not have aluminum but they have enough other junk you don’t want to put into your body. Remember, sweating is a way to release toxins out of your body. The armpits not only clean the lymph for the breast but also the head and neck. That’s your sinuses, your teeth and gums and your thyroid. Now, why would you want to plug that up? When I first started doing breast thermography and saw the lymphatic congestion under the arms it was harder to get our ladies “off the crack”. Sometimes putting antiperspirant products on is just a habit and not really needed. Especially when you are exercising and want to sweat it out. You may get wet, but if you are not toxic you won’t have an unpleasant odor. Every year when I go to the Natural Products Expo, I pick up all the natural deodorants. Then we do our own research in our Sherman Oaks-area office and offer the best options. In 2006, there were just a few natural alternatives. Now, there are so many good choices. Our patients are always giving us their finds and recipes for homemade deodorants. The patients who have tried to use a healthy option for many years often turn to the crystal stone. This is Potassium Alum. Although it doesn’t have all the nasty ingredients seen in drugstore brands, it is still a form of aluminum and we see lymphatic congestion with it is used. We see improvement in follow up breast thermography imaging when the toxic products are switched out to pure products. 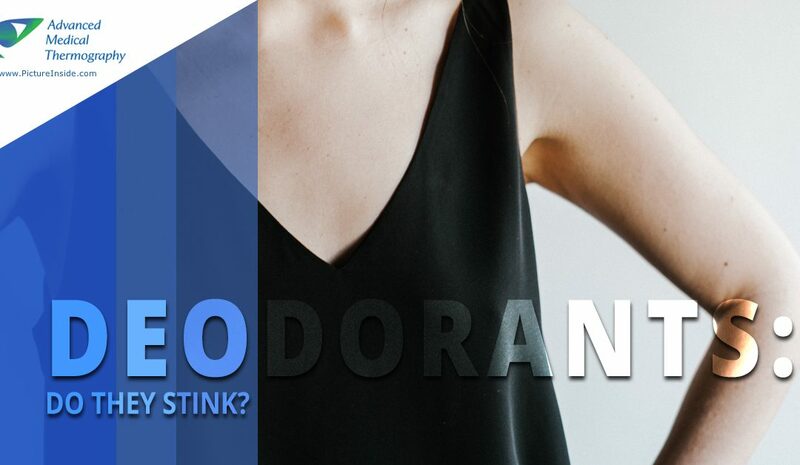 What should you look out for when choosing a deodorant? Ingredient lists should contain only words you can pronounce: Keep it simple. Baking soda will absorb perspiration but can be irritating to some people. We offer a baking soda free option for those few individuals who can’t handle it. Fragrance is a chemical. Use only organic essential oils. Stay away from all Parabens. They are endocrine disruptors and may mimic estrogen. Parabens have been found in the breast tissue of women with breast cancer. Aluminum. If you don’t cook with Aluminum pots and have stopped using aluminum foil, why put it on your skin? There are so many reasons to avoid it. Triclosan. It’s in many hand sanitizers and can increase testosterone levels. It’s also classified as a pesticide and possible carcinogen. You don’t need it. Propylene Glycol. It’s in the Tom’s you’ve been buying. Possible neurotoxin. We see this clog up the lymph as well. I hope this information encourages you to keep your body functioning at optimal levels. We can monitor your progress with breast thermography which includes the lymph areas in the underarms, and above and below the breasts. Little changes we make in our lifestyle choices can improve our chances for breast disease prevention and well being. Remember to like our Facebook page for our Monday Move your Lymph series, where we share our best finds and strategies. Be your natural best and you’ll be smelling like a rose. Or Lime, or Jasmine, or Lavender or Sage just to name a few of our favorite deodorant scents.